The Good: The UI is clean and straightforward. On-screen menus explain the different options very clearly. The color in outdoor, well-lit settings was very accurate. Macro shots were clear. The Bad: For such a great UI, I was surprised at the mediocrity of certain features. The most problematic issue I found was the M853 wouldn't mount to my Mac. Neither iPhoto nor Image Capture recognized it as a USB mass-storage device. The display is too small to get a decent field of vision. There are few options for taking manual shots, and the buttons used for these limited options aren't labeled. The M853 had the worst battery life of any camera I tried. Low light/no flash situations yielded poor pictures. The Verdict: A beginner will be taking pictures right away, but it's not worth the frustration that comes later. The Good: The CoolPix is so simple that it pretty much has two modes: Auto and Easy Auto. No pure manual mode exists, but there are some scene options available if you need something more specific. Outdoor pictures as well as close up macro shots looked good. Most of all, I really loved the 3" LCD display—larger than any other I tested. The Bad: It may be too simple for people who like to tinker with their shots. You can adjust exposure and ISO, but the options don't help very much and you may not have as much control over your pictures as you'd like. Low light shots came out very blurry. I am not fans of AA batteries in cameras, and this one takes two. The Verdict: This camera is a no-brainer for those with no-brains. It's pretty much the digital equivalent of a disposable camera—decent pictures for a decent price. The Good: This camera takes pictures and it takes them well. Outdoor pictures came out bright and colorful, and turned out best when we were able to get a clear shot of the subject without background distractions. Manual options are comprehensive and show changes live, allowing you to see your alterations. The A580 took the clearest pictures of any of the cameras in dim light/flash free situations. The Bad: It's bulky and unattractive. Pictures taken from a distance were out of focus and came out bad. The UI is cumbersome. Indoor, well-lit, no flash macro shots did not come out well (though maybe that's asking too much). It too runs on AAs, which I have avoided buying since 2002. The Verdict: If you want the best pictures you can get in this price range, the A580 is a good choice. If you want to win the $150-and-under point-and-shoot beauty contest, you better keep shopping. The Good: Pictures on the S750 turned out bright and crisp. Outdoor shots looked good, and so did indoor macro shots. Plenty of manual options put you in control of the pictures you take. The Bad: It helps to have some experience with digital cameras if you want to get the most out of the Cyber-shot. The auto mode is fine, but the manual options are the stars of the show. The scene modes are few and located on the camera dial itself, not a menu, adding some awkwardness. Low light shots were blurry. It uses Sony's proprietary Memory Stick, and not SD, a big no-no in my book. The Verdict: The Cyber-shot is a very complete camera, it takes good pictures in different situations, has many options as well as a solid UI. I think it's worth learning all of the features on the camera; after all, this will be an investment, and it could improve my photo-taking skills. The Good: The A735 is seriously cheap—$40 to $50 less than the rest—and holds its own when it comes to features. Manual mode is full of options. Bright light pictures had rich, deep colors. The Bad: Most pictures didn't come out well and were very dark. Indoor and low-light situations were blurry and unfocused. The UI is a mess, way too many options and not easy to figure out. I've said it before and I'll say it again, I don't want no stinking AA batteries! The Verdict: If you're super-broke, wait until you save up some more and get something nicer than this. It will take pictures, but you won't be happy with most of them. The Final Word: Point-and-shoots in this price range will never be masterful at taking great pictures. However, if you don't have the money or desire to make the DSLR investment, or even spring for the next step up, you don't have to be stuck with junky pictures or a junky camera. There are different things I liked about each one I tested, especially the screen on the Nikon and the picture quality of the Canon. 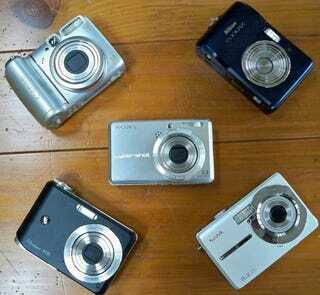 But for the best all around package, I'd spend my hard-earned $150 on the Cyber-shot DSC-S750.